Today Bicker is some 8 miles (13 km) from the sea, but was once on a large tidal inlet known as Bicker Haven. The old river has shaped the layout of the village, as the roads still follow either side of its winding course, a unique feature in the Lincolnshire fens. The Bicker river remains as the drain (a local term for a larger watercourse) that still runs through the village centre today, albeit carrying very little water. The present Methodist Chapel of 1908 replaced an earlier building of 1854 from which only the school room remains. The Lincolnshire Fenland is often thought of as having been wet and marshy until the 17th century, but this is not so. Much of the locality was occupied in Roman times when the sea level was lower than today, but later flooding caused problems, coinciding with the end of Roman influence. Re-settlement on a broad silt ridge was the foundation of the present Wash villages in approximately the 7th century AD, at about the same time that Christianity was spreading through the country. The name Bicker is of Scandinavian origin; it means ‘the place by the marsh’. We do not know the date of the earliest church in Bicker, but it was here before 1086, as it is recorded in Domesday Book. Fragments of Anglo-Scandinavian style carved stone in and near the church include pieces dating from the mid to late tenth century. The medieval settlement developed at the head of a navigable waterway and its location was important for trade. Imagine houses lining the waterfront with the large church overlooking a market place and quay, with fishing boats alongside. Over the centuries Bicker Haven gradually silted up and the channel could not be maintained. Meanwhile nearby Swineshead and Donington retained their markets on account of being on more useful west-east land routes, which Bicker was not. By the year 1600 the former Haven area was largely dry land as far east as Gosberton Marsh and was soon after finally enclosed from the sea. A local tradition that the Red Lion (built 1665) was once a lighthouse has no historical basis other than its position beside the river, by then already reduced to a trickle. 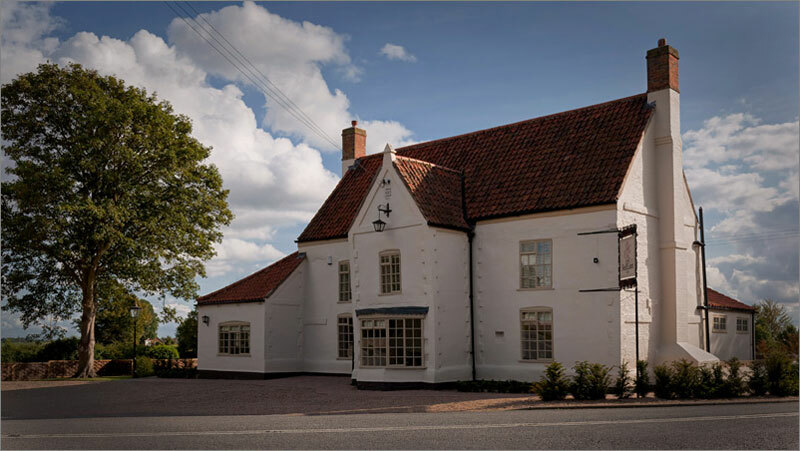 Fenland Artisan Mannerist style dating from 1665. 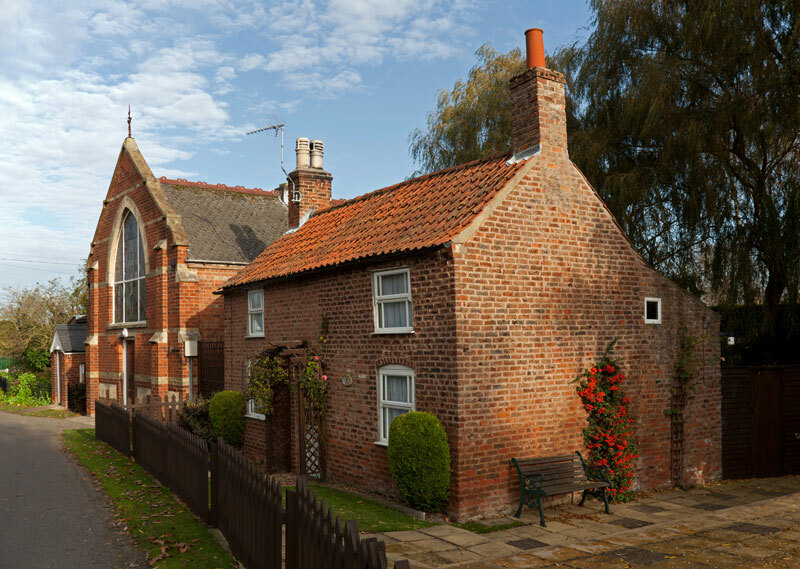 In addition to the church and the Red Lion there are a number of timber-framed houses, some of which would have been of traditional Lincolnshire mud and stud. Brick dwellings and farm buildings from the 18th and 19th century still characterize the area and from the 20th century there is post war wooden housing donated by the Swedish government. Good quality farmland was always the key to the area’s prosperity. From centuries of mixed farming there has been a gradual change to arable, hastened in 1767 by enclosure of the lowest-lying fen to the west, between the village and the South Forty­ Foot Drain. The 20th century saw mechanization and the loss of the working horse. Today arable dominates, with vegetable crops and vegetable processing amongst the chief features of the area.